I just read that the coastal commission denied the building of the toll road extension. I am extremely pleased to hear this but I am very worried now because I just found out that our Governnor Scwartzenegger has decided to close down some of our parks so he can balance the budget. I don't believe that for one minute in that he needs to do that to balance the budget. I am sick and tired of our politicians and their hidden agendas, and I think this one might possibly have something to do with the toll road. I am interested at what others might think about this. Is the Governor going to try to pull a fast one and give those @$$#%!%$ the green light to build that piece of garbage they call a toll road????? Praise to the people for standing up and letting themselves be counted, and saving this beautiful and unique break. I was lucky enough to move to SoCal in 2006 so I have only been able to enjoy Trestles for a relatively short period of time, but long enough to fall in love with it and to be immensely relieved that the ridiculously shortsighted toll-road extension has been denied. 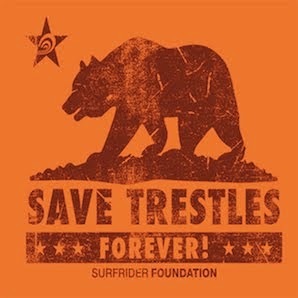 Well done Surfrider for doing such a stunning job at raising awareness for this very important cause.